I’ve got about 5 pizza crust recipes but I’ve only used one of them so far. I think it comes down to that I don’t usually have a lot of time to make the crust, so I haven’t bothered to take the time to experiment. As usual, I found this recipe from somewhere online and neglected to save the location (I think it’s from Allrecipes though). I added the cornmeal part though, both because it keeps it from sticking to the pan and because I like cornmeal on the bottom of my pizza, what up. I don’t know how accurate the baking time is. It always took mine about an hour, but I don’t know if it was lots of toppings making the pizza wet or because I was at a 5,000 ft altitude which always messes up cooking. Just watch it til it’s crispy. Crispier is better than if you’re not sure, it seems. 2. In a large bowl, combine 2 cups bread flour, olive oil, salt, white sugar and the yeast mixture; stir well to combine. Beat well until a stiff dough has formed. Cover and rise until doubled in volume, about 30 minutes. Meanwhile, preheat oven to 350 degrees F (175 degrees C). 3. Turn dough out onto a well floured surface. Form dough into a round and roll out into the shape of the pan you’re planning to use. Sprinkle some cornmeal on the bottom of the pan, then place the dough in it. Cover with sauce and toppings and bake in preheated oven until golden brown, about 20 minutes. This lady has tips for making “perfect” pizza crust, but as I’m usually feeding boys who either don’t cook or “like to grill”, “great” pizza crust will do just fine for me. I like to first brush a garlic+olive oil+seasonings mix on the crust, then put the tomato sauce, then the toppings. It’s so delicious. *or sprinkle equal parts oregano, basil and thyme on it. Add marjoram and rosemary if you have it. 1 tsp is just a recommendation, of course. I usually end up mixing the olive oil and garlic and spreading it on the pizza. Then I just sprinkle each spice over the top of the pizza. It’s probably around 1 tsp of salt and 1 tbls of everything else. I add the crushed tomatoes to the top then add some more pepper and italian seasonings. Then I add the toppings. Just put everything on the pizza, grind some pepper on top, sprinkle a little more cheese, and stick it in the oven. 425 is probably a better temperature just cos there’s a lot of stuff. Bake it for however long it takes. I’ll make one nearer to sea level sometime and figure out what’s normal. People often cook the chicken first, but I never did and it always cooked through, but maybe that’s because I had to bake the pizza for so long. As you can see, it’s supposed to be cheese, pesto, roasted garlic, potatoes, and seasonings. Here is someone’s version, though Escape From New York Pizza makes thin-crust and that person made a thick crust so therefore you should not trust the recipe. Anyway, if you’ve softened your potatoes a little and roast some garlic, put it on the pizza and you’ll be good. When my friends and I did it, we didn’t cook the potatoes but they were fine, probably because we sliced them really thin. 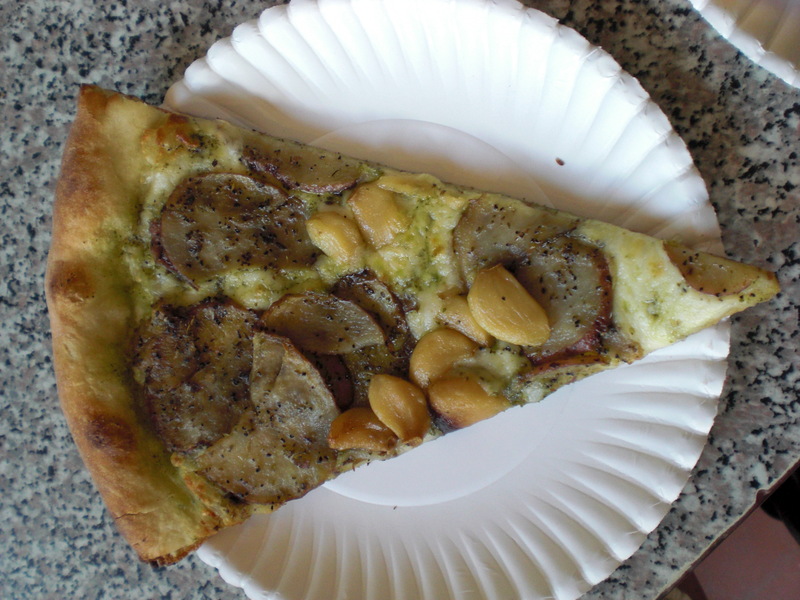 We also just sliced the garlic and put it on top (it was kinda an everything pizza). 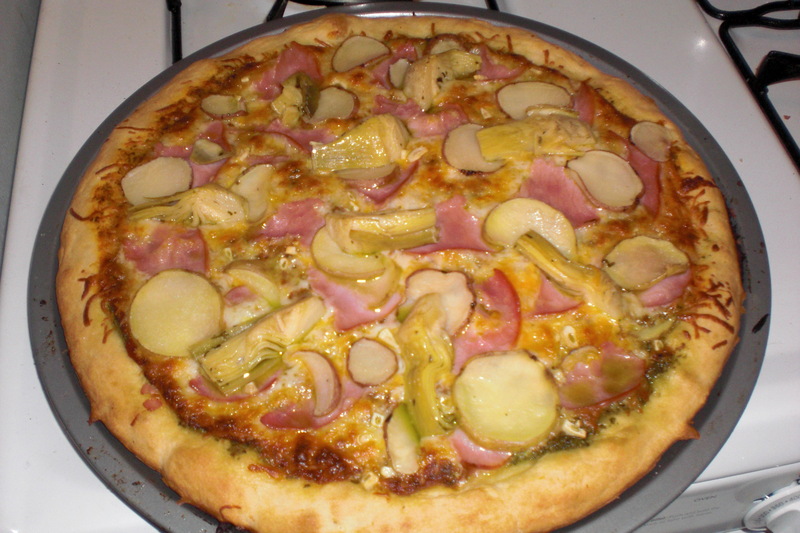 As you can see, we used pesto and red sauce, some ham luncheon meat, the potatoes, garlic and artichoke hearts. It was delicious. (That crust was a boxed crust my friend made. I don’t have pictures of the one the recipe makes). Use whole-wheat flour instead of all-purpose. Brush on the garlic, olive oil, salt, pepper, basil, and oregano. Add onions, peppers and tomatoes. Slice yellow squash and zucchini really thin and lay it on top. Sprinkle liberally with paprika and cinnamon. I will make a post about this one in particular soon. Finally, I just wanted to say that I’m a big fan of grinding black pepper liberally over your toppings before baking. It sticks to the toppings (particularly if you use chicken) and takes really good. I tagged this post as vegan just cos you can leave out the meat and cheese if you want. Just use the olive oil + garlic and maybe some pesto or peanut butter or something vegan, who knows. I should try peanut butter. Hmmm….